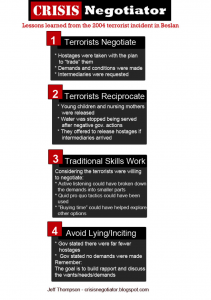 The Crisis Negotiator Blog: Crisis Negotiation Techniques in Terrorist Incidents: It’s Been 10 Years Since Beslan- What Have We Learned? With the Society for Terrorism Research (STR) 8th Annual International Conference fast approaching, STR, partnered with the Center for Terrorism and Security Studies (CTSS), is launching a series of guest blog posts, written by those who will be presenting their research at STR14. In the sixth installment of this series Detective Jeff Thompson(@nonverbalPhD) discusses his work on the lessons learnt from the Beslan School Siege. Detective Jeff Thompson is the 2013/2014 recipient of the New York City Police Department Commissioner Raymond W. Kelly Scholarship and attended Columbia University as Research Scholar. His research topic was crisis and hostage negotiation as well as terrorism related incidents [This article does not reflect the opinion of any group or organization that he is employed by or a member of]. Ten years ago terrorists in Beslan, a town in North Ossetia Russia, seized a school full of children, in what is still one of the deadliest terrorist incidents to have occurred. The incident provides valuable insight with respect to crisis and hostage negotiations that can assist negotiators and government officials to be better prepared if they were to be involved in a similar situation where negotiating with terrorists could be the best option to ensure the least amount of casualties are suffered. Despite the incident having displayed numerous moments that were clear examples of the terrorists escalating violence, the Beslan incident also offers valuable insight into missed opportunities where negotiators could have employed certain tactics that could have increased the chances for a more peaceful resolution. 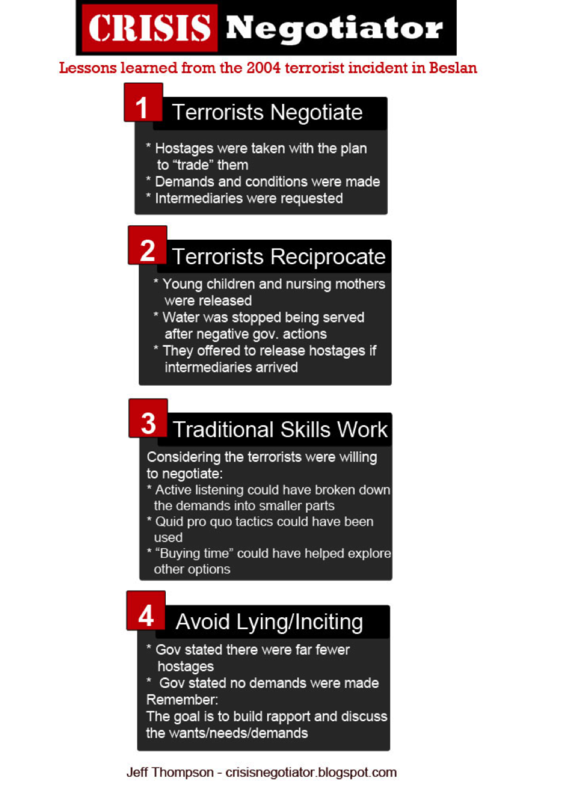 A review of this incident, specifically conducted by Adam Dolnik (and co-author of our paper) demonstrates that established crisis and hostage negotiation skills can be effective yet the established methods of determining if a hostage incident can or should be negotiated as well as the methods of measuring progress needs to be reviewed. Read the full article [HERE] and click the info graphic to see a larger version of it.